This post was originally published as a guest post on Fit Is a Feminist Issue on September 30, 2016. Featured photo (above) of me climbing in the North Cascades taken by Tony Lu. I’ve had some degree of pain almost every day for the past 9 months. For the first few weeks after I injured my back, I could barely stand, sit or walk. I couldn’t go to work. I couldn’t take care of anything at home. Before this, I had only experienced minor athletic injuries. A sore knee from hiking too far. An aching finger tendon from pulling too hard on small climbing holds. These all resolved quickly with a little rest. This is now my version of standing straight. This time was different. I was warming up doing an unweighted squat in the gym. Then out of nowhere, I felt the spasms of pain shoot through my back. This exercise was usually easy for me. I had learned how to do it safely with a trainer. I used to hesitate to tell people how my back injury happened. I was embarrassed that I did this to myself in a part of the gym where I often felt like I didn’t belong. I had worked so hard to convince myself that I could take up space among the muscular men, bench pressing and deadlifting what seemed like so much more weight than me. And it made no sense how such an easy movement could have caused so much destruction. I now know that I was overtraining. That one squat probably wasn’t to blame. I was exercising too hard, too often and my body had broken down. 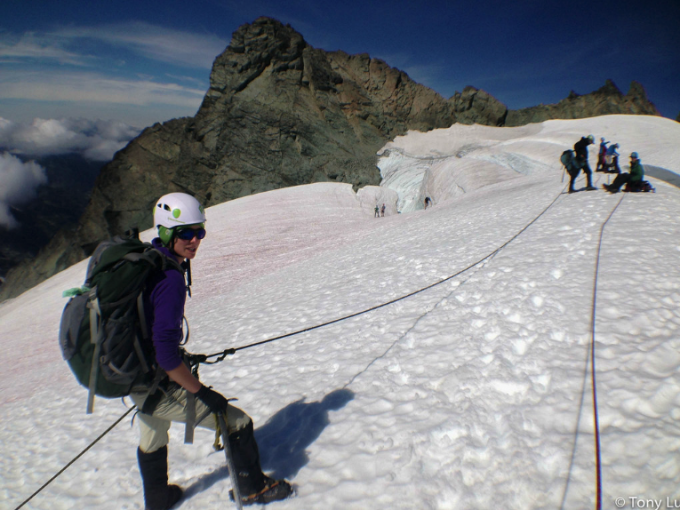 My goal had been to get stronger to keep up with others on climbing and mountaineering trips. My favourite sports involve carrying a lot of stuff uphill for long distances. This poses some unique challenges for petite people, such as myself. All the gear all adds up quickly: a warm sleeping bag, a down jacket and rain coat, food, water, climbing harness, crampons, ice axe. On one long trip, my backpack weighed just over 40 pounds. At 35% of my body weight, I was carrying what many consider the upper limit for a well-conditioned hiker. This meant I relied on other people to carry all the gear shared by our group, like a tent and climbing rope. Distributing gear proportionally according to a person’s size is fair and a widely accepted practice. However, it always bothered me to be the smallest person who carried the least. I also often worried that I’d be the slowest person who held everyone back. Being one of the only women on some trips meant I felt even more sensitive to any physical differences. After several months of treatment and physical therapy, my back pain began to decrease. I slowly began to take up the things I loved again in new and different ways. Instead of an all-day hike, I went on a short walk to the beach with a friend. Instead of trying to climb the hardest routes, I meandered up some of the easiest walls I could find. Returning to the backcountry was harder. Despite training and testing my limits close to home, I was still so afraid of re-injuring myself in the middle of nowhere. My first trip into the wilderness was on a multi-day canoe trip with my sister. An hour into paddling, I broke down into tears. I was so afraid. We stopped and set up camp at the first spot we found. We carried on that way all week: paddling short distances with long rests. It was not the trip we had planned, but I was grateful just to be out there and for my sister’s patience. My view from our canoe in the Boundary Waters Canoe Area Wilderness, Minnesota. The following month, I spent time in the wilderness again on a week-long trip in the mountains. While my friends hiked and climbed, I earned the nickname “Base Camp Babe.” I spent a lot of time reading books, swimming, napping and enjoying the beautiful alpine views. As the week went on, I ventured out on increasingly more adventurous hikes and climbs too. One hour of scrambling equals one hour of resting. Vancouver Island, British Columbia. This injury has forced me to deal with my fear of being the slowest and smallest person in the group. This year, I’ve had to turn around before reaching the summit far more times than I’ve made it to any desired destination. My friends carry even more of the gear than before. I often have had to lay down for long rests in inconvenient (but beautiful) spaces. The view from a rest spot on one of the many mountains I did not get to the top of this year. Vancouver Island, British Columbia. What’s surprised me the most is that despite being up front about my limitations, people still want to climb and hike with me. People whose company I enjoy and judgement I trust. My climbing network has continued to expand and become more diverse, especially in terms of gender and age. While I am never going to carry a 70-pound pack up a mountain, I have other things going for me. Things like an eagerness to explore new areas, technical climbing skills and knowledge of local areas. I need to work on my limitations while focusing on my strengths. For the most part, we are roughly stuck with the bodies we are born with. I’ve learned that trying to overcome my fears and challenges by trying to change my body is not going to work.